I again start with an apology for not posting for so long! In my last post I mentioned concerns for my mother. She was able to have her issue mostly taken care of. She will need to be seen by doctors for the specific issue at certain time intervals, but she is out of immediate danger. She does still have unrelated pain, which could use prayers- and still peace and strength. We are doing well here. Joey is enjoying preschool, and Jules is as well. I travel for classes some days of the week, so we have had to choose a daycare (and preschool) and it's worked out wonderfully. The kids are both excited to go there, and excited to come home. I am hoping to avoid having them in daycare more than 3 days a week, but we will see where classes lead. Juliet is doing wonderfully with her health. She is a hyper little girl, and she is also a snuggler. It's nice to watch the kiddos run around and wrestle. Classes are going well. I have Biology 102, Applied Calculus and English 102. Next semester I'm trying for Chem 111, ecology, speech and maybe statistics. Matt is working as usual, and enjoying some video games. He's been trying out the Rift beta and Black Ops. I am still playing WoW and enjoying it! We've also still been enjoying cooking delicious food, such as the flat iron steak Matt cooked the night before last. YUM! Sorry I have not updated in a long time, I have been quite busy with school. All are well, except I ask for prayers for my mother, for healing. I do not wish to go into details on a public blog, but if you wish to know details you may contact me privately. Simply pray for this: For her to have an easing of pain, for her to have full and complete recovery and for peace and strength. The kids are doing great, Joe is in Preschool and enjoying it greatly, and can make it most of the way through his ABC's, though doesn't recognize all the letters when he sees them. Juliet is a very active and intelligent girl who astounds me each day with new concepts, but is very bullheaded and demanding. They are both shining stars in my life, and I love watching them develop into who they are. Juliet and Joe are both in love with dragons that are handmade by their Great-Aunt Simone and given to them by her and their second cousins. They like to snuggle up with them and watch How To Train Your Dragon. My hubby and I are working hard, me with school and home, and him with all the stress and strain of work. We enjoyed a day at ISU for the Science and Engineering Fair. The kids were a bit young for it, but I could tell they definitely had fun and learned a lot. We also watched the Chemistry Dept's Chemistry Magic Show. Mixed results with the kids, fascination mixed with fear (mostly Jules was afraid of flaming balloons, but totally fine with other explosions). Flaming Gummy Bears, also fun! I have a Biology 101 exam tomorrow, and have to get back to studying, so there is my brief update!! I'm terrible about keeping such things up to date, but maybe one on the bible will help me get better about it. As for life: things are going well, I've had a crazy summer and more craziness to come. Kids are great, and they enjoyed a nice trip to WA and OR for three weeks with me, and we missed their daddy greatly while gone. We had loads of fun though! We saw family, and I have lots of pictures. Before that we got to see Matt's parents and brother and his family in Island Park. There are a lot more pictures, but I am just putting these here for now. I'll make a picasa album of the best, and link it. There were a lot of things we did which still need to be taken off the camera. I do not have pictures of our time at Detroit Lake, sadly- aside from a couple fuzzy ones taken on my phone. We had a great deal of fun on the lake. We also went to a waterfall, I do have pictures of that with me, just not uploaded to picasa. We will be leaving on a camping trip to Redfish Lake soon, and from there I will go to Sacremento to spend time with my Mom's side of the family. Looking forward to it! In which I get into the ring and fight pneumonia. So. I was in the hospital Sunday, Monday, Tuesday, and Wednesday. Via the ER. Last Monday I had a bit of a cough. Tuesday it was a frequent cough. Wednesday was Juliet's appointment, and I had pretty frequent cough and wore a mask. Thursday my cough went spastic, and I started feeling wonky. Friday I developed a fever and said "OK. Time for Community Care." - They ran a couple of tests, and gave me prescription cough medicine and said to come back if it got worse. They gave me a rocefin shot to try to fight any possible bacteria causing the issue. Saturday my fever reached 103 and my fingers had turned blue once. Mind you, I'd never seen my fingers turn blue even when freakishly cold. I found it mildly fascinating and vastly scary. I started seeing spots. Community Care prescribes antibiotics and an inhaler, and says to come back if there's no improvement. As a parting gift they give me another rocefin shot mixed with anther, stronger antibiotic. Now my bum hurts on both sides. Sunday- bright an early I'm in again. Still feverish, barely functioning, coughing constantly and throwing up. The last meal I'd had was cottage cheese and pineapple on Friday morning, and was getting rapidly weaker. Dehydrated. This time the doc said "This is beyond us, or what can be done at home. Go to the ER!" Yay. ER. Now. By this time I'd developed a migraine from all the coughing. Every alarm, beep, holler, every flickering of light sent me reeling. Imagine a gal curled on a hospital bed, coughing, trying to hold her head together at the same time. At least it felt like I had to hold my head together. Coughing causes some pain, but not much. Really, none of the pneumonia issues were causing pain, they were simply draining me, melting me away. The migraine on the other hand, added an element of severe pain. I asked a nurse for something for the pain, and she gave me dilaudid. For an amazing (hour maybe?) the migraine pain was gone. The docs drew all kinds of blood for tests, got fluids going, and scratched their heads. They said I had an infection SOMEWHERE, but my lungs looked clear. They'd eliminated all the normal pneumonia culprits and were on to more exotic stuffs. They moved me out of the ER to continue treatment upstairs in the regular rooms because they'd finally gotten me stable. There I remained, with a migraine being relieved by dilaudid and little ability to rest. When my doc came in in the morning (tuesday) he gave me a medicine that cleared up my migraine. It was PURE BLISS to have that nasty thing gone. I could sit up, even watch tv a little! Wednesday morning the doc said that the tests were still out on Legionnaires' Disease and Whooping Cough. He said that it sounds more like Legionnaires' (wha??). He also said that my treatments are working, that what is being done now can be done at home if I wish. Goodness did I wish to get out of the hospital! So now I am home. Still not sure which type of pneumonia I have but I'm getting better. I just have to watch out for any fever or whatnot. I am weak as can be, I sound like a car with bad breaks mixed with a barking dog. My kids are with their Grandmom and Grandpap. My hubby is taking care of me like an absolute hero. And again, dear God. I am begging. Give me a BORING year- healthwise. I am really tired of this, and I don't know how much more I can take. As it is I may have weakened lungs for the rest of my life. I'm on umpteen different kinds of medicine, and all I want is to be strong for my family. Please, I'm begging! 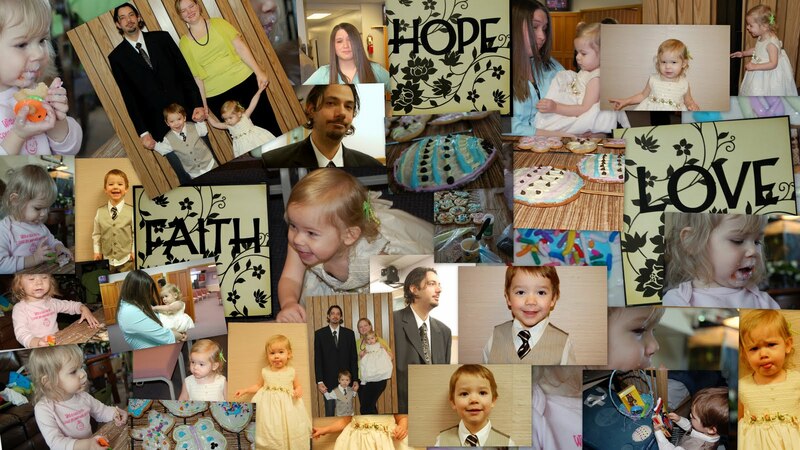 A story, and an update on Juliet. She was a vivacious, beautiful, passionate woman who lived life to the fullest. She hated that her skin had wrinkled, that her skin began to sag, that her vision faded and her hearing was almost gone. She lived in a box, hearing only muffled voices, thinking people were not even interested in her opinion anymore. She said "Why don't you talk to me anymore?" even though we wanted to- we were tired of yelling*. She was stubborn. She did not want to wear a hearing aid- that's for OLD people- and besides, what she heard was overwhelmed by the ringing in her ears. She has survived two amazing men in her life, and her closest friend is her daughter. She holds her great-grandaughter close, who bears a matching scar to her own, down her chest, reminding her that even her own scar is a thing of beauty. She earned her scar when she was 75*. Far too old for a major heart surgery. Many doctors told her there was no hope. She should just enjoy her final times with her family. One doctor saw hope. He said it could be done, and it was. She earned 13* more years with her bravery. Then, in the year before she left, she held her great-granddaughter with a matching scar. A scar that not long ago would have been forfeit, as nothing could be done. As her time drew near, emphysema and a broken heart finally catching up to her- her kidneys shutting down and her liver losing function, the doctors- including the one who had given her her extra years- said that all that could be done had been done. Her daughter could not believe it. Her daughter needed her mommy there- her mommy who had been her companion in dark hours and joy. As her daughter leaves the room she turns to her son: "Please let me go." Her elder living son is strong enough. He's seen so much, his heart is tender, but more logical than her youngest child. She knew her daughter's heart would simply break to hear she wanted to go home, to see her eldest child who had passed on so many years before, and the men in her life that she had so adored. She had been given the richness of hearing all of her children's voices in those days. Her daughter had done the hardest possible thing to do- calling her brothers to say that they should travel to see their mother, one last time. Even so, her heart refused to admit that this was really the end of her mother- how can someone who lived SO FULLY be going? What will I do without her? Her son cried. The doctors had heard her say the words as well, and they knew that this was the time. Her daughter wept when she was told her mother's words. A short while later, the room grows quiet. Her daughter has gone to eat, her son in law and her granddaughter's family all gone away to have a sandwich. Her eldest living son sits by her side. She feels it is finally time to let go. She did not want to let go while her daughter was there- ever showing her intense love for her only girl, and there is no better hand to hold her than one of her precious boys. Her breathing changes. She begins to leave. Her eldest living son calls her daughter and everyone else back. Everyone surrounds her and cries their farewells. Her great-granddaughter does not understand, she lets out a baby girl whimper. I wrote this, a sort of memory of my grandmother's death. I know it may not all be true, and facts which I'm unsure of have asterisks. All others are subjective, memories of my own, and my memory is not always the best. I have been known to remember things that did not happen, and things that happened as being different than they actually were- so please take it with a grain of salt. This is purely a reflection of my emotional understanding of my beloved grandma's last day- and by far doesn't encapsulate the whole of that amazing woman. She was ... so amazing! She was strong, willful and vibrant. Juliet had her sedated echo on Wednesday. We traveled to Salt Lake City and stayed at a hotel overnight, then headed to Primary's in the morning. I sat with Jules while she was sedated and her daddy took Joey on a tour of that awesome hospital. As usual, she was taken care of so well! In a year she'll have her normal checkup down in Poky, and then when she's almost 4 we'll go down again for the next echo. The only forseeable reason to go to salt lake before then is if it's decided that she needs surgery on her urinary tract (the urinary reflux) and it's better for kids who have had heart surgery to be sedated by those familiar with their needs. She's not had a UTI in a very long time, so I'm betting she won't need to have that done. * Sometimes during early pregnancy, a baby's heart fails to form properly, resulting in structural abnormalities known as Congenital Heart Defects. Although some defects are genetic, in many cases the cause is unknown. * Nearly 1 out of every 100 children born, are born with a CHD! Congenital heart defects are the #1 cause of birth defect related deaths, and the leading cause of all infant deaths in the United States. * In the United States, twice as many children die from congenital heart defects each year than from all forms of childhood cancer combined, yet funding for pediatric cancer research is five times higher than funding for CHD. * In the last decade death rates for congenital heart defects have declined by almost 30% due to advances made through research. However, only one penny of every dollar donated to the American Heart Association goes towards congenital heart defect research. Juliet has her next cardiac checkup soon. She'll have to be sedated for it. We've all been sick. The kids have been snot running down the nose, hacking and crying sick. I've had some kind of severe UTI that has left me with quite a bit of flank pain. Matt is getting sick as well. We're praying for it all to be over soon. My mom and dad have moved to Oregon. They're sort of still in the process, but they're both over there in an RV for now. We're sitting one of their dogs- Roxy and a kitty- Cassie. I think that's all I can really type for now. Exhausted. As I go through things which have come from my parents' house (as there were things which I had never taken with me when I moved out) I find things which hold nostalgic value but I know I will never wear again. I shall post them here and to facebook to preserve their personal value and to tell stories. 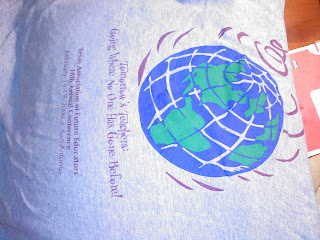 The above shirt was one I got for attending a conference for Texas Association of Future Educators. Somewhere I have the speech I delivered for TAFE which was very well rated by the scorers, but did not win (the one that did win was a direct plagiarism of a story from Chicken Soup for the Soul). I find to this day that I still want to be a teacher- hence my return to school next semester. 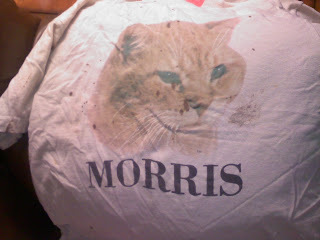 Morris the Cat. 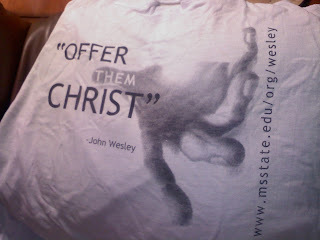 I loved this shirt. It was a sort of evolution of my love for kitties and my willingness to wear them on my person. Now I am far more likely to wear something with a simple vaguely-feline shape on it. Nor do I have many kitty decorations in my home. We do have two living, breathing ones that decorate our furniture most of the time. 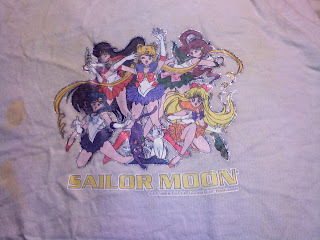 My friends and I were 'into' Sailor Moon in high school. I was Serena (middle) and Steph was Luna (purple kitty at bottom) and Lisa was Raye (Upper left). The other folks were a bit variable. You know how high school friendships are, odd and complex. Fun times, Fun times. Ok... well there were a few more shirts (over at my facebook page) which have other stories, but these were the main ones.